More and more people make purchases or perform banking transactions on the Internet. The e-mail platform is therefore the most important online communication tool that many scammers exploit to circulate fraudulent messages containing ambiguous links (which refer to fake websites) and e-mail addresses that asks personal information from the most naive users. Phishing works because it turns to stay relevant. The criminals create new scams & it is therefore one of the most common threats we are exposed to as Internet users. Security products certainly represent a large part of the puzzle. But awareness is also needed to complete the picture - especially among those who represent a potential target. Though understanding if a scam is hidden behind a message received on e-mail is not always easy but if you don't even try to upgrade your knowledge about this you may put yourself in a big trouble. 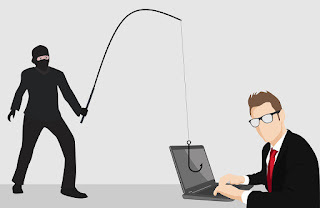 Phishing is a fraud attempt in which a sender pretends to be some authorised person from some company & tries to obtain the sensitive information of an unsuspecting victim. In this process scammers use fraudulent e-mail as a bait to "catch" passwords. The whole mechanism is quite simple: cyber criminals send apparently official e-mails from banks, payment service providers, online stores or e-commerce, in which users are asked to enter there usernames & passwords by clicking on the links they sent which takes the users to false login pages. So anyone who reveals sensitive information in this way becomes a victim. The goal of these phishing attacks as said earlier, is to be able to access user names & passwords of the users, to make reservations or purchases for themselves. Unfortunately, users only notice these attacks when they see their statements. Check if the sender's email address matches the name of the company from which it appears to be. When an email contains a link then try moving the mouse over the link and check the internet address that is shown in the lower left corner of the browser window to make sure that it does not take you to fake website. Check that the URL coincides with what you expected and that there are HTTP security protocols for data transmission. If in doubt, do not click on the link and do not manually enter the Internet address on your browser. Even the stylistic forms used in the e-mail help to unmask little serious messages. If the message begins with a generic greeting, for example "Dear Client", you should ask yourself why your credit institution or online store does not know your name. A company that contacts us for legitimate purposes uses our name in the emails they send. View the entire email and compare it with the emails you've already received from that same company. If they do not coincide, then it is likely that it is a fraud. Check for spelling and grammar. If a message in your inbox is full of grammatical errors, you can rest assured that it is a scam. If you recieve unimaginable offers then do not get excited. When something seems too good to be true, it is most likely not true. It is a sad conclusion but unfortunately it is. If you receive a message from an unknown user who offers you smartphones, tablets or hi-tech accessories at ridiculous low prices, you can be sure that this is a scam. Avoid believing in e-mails regarding lottery winnings, prize competitions. The concept is simple, if you have never played that particular contest it is impossible for you to receive a winning prize. And in case if you have actually played in the same or any similar competition, then remember that the method to receive payment is never to send an email with your personal data. Be very careful, they seem simple concepts but often many people fall into this trap. If the message requires personal information, such as credit card information or an account password. Make yourself on high alert before taking any action. Sometimes, scammers act directly with real threats, For example, you may receive an e-mail that says that your new car has unpaid installments and that if you do not send the missing installments immediately, you will be sued. Now you don't have to be a lawyer to understand that this is definitely not the way a dealership would act. What action should you actually take? Well if you have received an e-mail that appears to be a phishing attempt, then before deleting it you should move it to your mailbox's spam folder and block the sender. In this way you will block other attacks from the same sender. In addition, you should also contact the company from whom the sender is claiming to be. Most companies offer various contact options, such as forms to fill out, with which you can report a phishing attempt.